operate efficiently, with longevity. 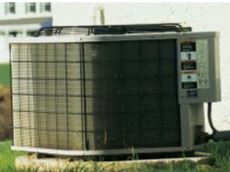 Many of the units we inspect haven’t ever had any maintenance or have had very little. This results in poor air quality, a system that may prematurely fail and inefficiency which costs you money. There are some easy ways you can make a positive impact in the upkeep of your split system. calendar in advance to remember when it needs to be changed.The filter is important to not only the air quality in the home, but to the air flow in the rooms farthest from the furnace. A dirty air filter can cause a loss of air flow to these distant rooms. 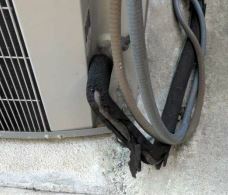 It can also cause the blower to work harder, which costs you money on your energy bill. yourself money on your energy bill and extend the life of the unit. a. Most importantly turn off the power to the unit. b. Make sure that you cut back any plant material to a distance of about three feet from the unit. sprayer to rinse the smaller particles of dust, dirt or pollen. move the screwdriver or table knife along the fins to straighten them out again. insulation at the hardware store and wrap it onto the pipe with an outdoor rated tape. Copyright © 2019 Sentinel Inspection Service, all rights reserved.